Since 1980, Cake Expressions has been baking and creating delicious and unique celebration cakes for the entire Bay Area. After graduating with a degree in advertising from San Jose State University in 1974 and working on several interesting national advertising campaigns in San Francisco, I found myself in 1976 working at Stanford University in the Public Information Office but spending weekends helping at a local bakery and loving it! In 1977 I decided to possibly take up cake decorating full time and had the privilege to start my career as the assistant to the world famous Swiss cake decorator and pastry chef, Max Ackermann. 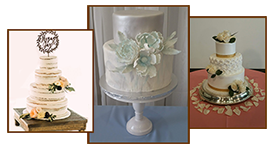 After 3 years of honing my skills at several specialty cake shops including - The Court of the Two Sisters in San Francisco, I opened Cake Expressions on my birthday in 1980. Working now with the best, most talented and dedicated staff anyone could ask for, I am able to call upon many years of combined experience. We are all professionals that take pride in creating wedding and celebration cakes that are the highlight of every celebration. In case you’re wondering, that is me on the homepage getting a little thank you from a happy bride . . . thank you notes are really nice too.